Yes, all of this was "FREE". I cashed in a significant amount of points that we had accumulated and never used on my husband and my credit cards. While I am happy to tuck away the credit cards and not use them, I certainly didn't want the points we had accumulated to become a pumpkin and disappear. So if you use a credit card that has a rewards program, check your statement to see how many points you have and make sure they aren't going to be expiring soon because after all you did earn them. You don't want to let those expire because look at all you could be missing. MISSION: More School Clothes - Really? Today after my daughter's ballet class, I decided to take a trip to our OshKosh B'gosh store to see if they had a pair of sparkly pink shoes in stock. I had received a $10 cash back certificate from a purchase I had made a few weeks ago and I wanted to use it before I forgot about it. Unfortunately, the store didn't have the shoes in my daughter's size (plus she wasn't a fan of them in person), so we decided to wander around the store. My daughter fell in love with this hot pink tunic. Reluctantly, I pick it up and we continued to look around. She has a lot of pink things and I was looking for something a little different, but as I said she was in love with this tunic (sigh). My problem is, I've become quite the penny pincher these days so paying $26 for a shirt for my 7 year old to spill spaghetti sauce on it (cringe) is just too much. Lucky for her, the table it was sitting on said the tunics were $12 on sale. I love sales! 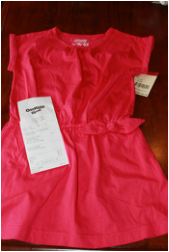 I love good quality clothes too and I've had a lot of good success with OshKosh products. We found her size and off she went in the dressing room to make sure it fit. After giving the mommy approval, we went to the register to check out. Before all sales and discounts the total cost was $27.89. I gave the girl my certificate so she could deduct the $10. My final out-of-pocket cost was $2.14. My overall total savings was $25.75! That's a 92.3% savings. What can be more fun than shopping? Saving money!!! It's that time of year again, where I have to spend money on things like school supplies, clothes, and shoes. I honestly dread this time of year because it just seems like money is flying out the door. It's probably my husband's second least favorite time of the year, only to be superseded by Christmas. With my new approach to our spending habits, I'm looking for ways to stretch how far my dollar will go. Our recent trip to OshKosh B'Gosh turned out to be a pretty good deal. 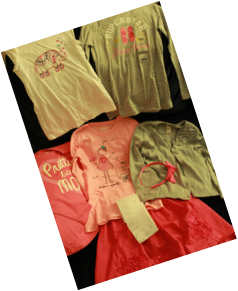 My daughter picked out an adorable pink skirt, a little t-shirt that was on clearance, a cardigan sweater, a headband, and three long-sleeve t-shirts to go with jeans and leggins she already has that still fit. Each of these items original prices seem a little high. The skirt she picked original price was $28, but it was on sale for $16.80 that day. The short-sleeve elephant design shirt was originally $20. The cardigan's original price was a whooping $44 (yikes). The headband's original price $8.50. Each of the long-sleeve shirts were marked $20. Grand total for everything would have been $172.14 (feeling a little queasy at the thought). So thankful for my shopping skills and ability to look for a bargain. First of all, I'll admit one of the reasons I went to this store was for the skirt. OshKosh is one of the few places I've found recently that have "age appropriate" little girl clothing. Secondly, they were having a pretty good deal - buy one long-sleeve t-shirt get TWO free! I love free!!!! Instantly, that's a $40 savings. Everything we bought that day was on sale. Her cardigan was marked $26.40 that day (more reasonable than the suggested price of $44). The buy one get two deal made each of those shirts cost $6.67 each. The short-sleeved shirt was on end-of-season clearance for $6. The headband was $5.95 and the skirt was down to $16.80. 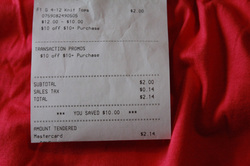 Already a significant savings, but I did my research before I left the house and found that by signing up on www.Carters.com I received a $10 off a $50 purchase. I definitely qualified for that. After all the clearance discounts, sales, and coupons were applied my grand total was only $69.55! That's a 60% savings. One of my least favorite things to do is go shoe shopping with someone else. I used to think going shoe shopping with my husband was a form of legal torture because he's very particular about how shoes feel on his feet; however, after this last shopping excursion with my son I'm questioning who is worse to take shoe shopping. I wasn't willing to spend $82.99 on a pair of shoes my son desperately wanted after that the lady at the store told us the shoes would hurt his feet if he used them for gym class. Maybe it's because he had his heart set on those shoes that he battled me for over an hour trying to find another pair that met his liking. Whatever the case, it was painful - however, the amount of money I saved almost made it worth the hassle. 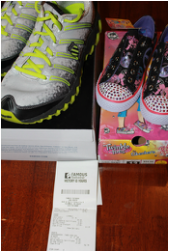 My son ended up selecting a pair of K-Swiss running shoes that were priced at $69.99. Not a huge savings from the original shoes he selected, but still a savings. My daughter had her mind made up in less than 15 minutes that she must get these Twinkle Toes by Skechers that were originally priced at $54.99, but happened to be on sale that day for $34.99. Already a $20 savings, sign me up! Only problem was they didn't have her size - UGH! Thankfully the store offered free home delivery, we'd just have to wait. We still have almost 2 weeks before school starts so we're ok with waiting. Let's talk about my incredible savings. The day we made our purchase, Famous Footwear was having a BOGO 1/2 OFF special. Sign me up, that already means my daughter's shoes will be less than $20. 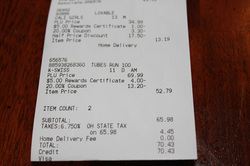 Plus I had brought a $5 off Rewards Member certificate I had received from my last purchase. Cha-ching! To my delight, the store was offering Rewards Members and additional 20% off their purchase the day we came in, so that brought the price down even more. Before all my savings my grand total was $133.42 with taxes (thank you Uncle Sam); however, today was my lucky day because I ended up only paying $70.43 for both pairs of shoes.